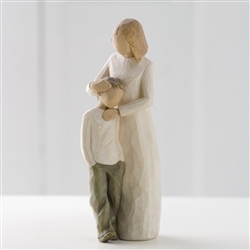 This beautiful Demdaco Willow Tree figurine depicts the special bond shared between a mother and son. Each Willow Tree figurine is cast in resin from original, hand-carved sculptures by artist Susan Lordi, then individually painted by hand. These beautiful sculptures speak to our spirit and embrace all that is good in humanity. Figurine stands 8" tall - and comes in a gift box. Makes a perfect gift for any occasion.